Miriam: That's her Hollywood voice. Addie Holden: Can it, mummy dearest! I was educated in England. Miriam: If you say so, Countess. This is definitely the best made-for-TV movie that I have ever seen! 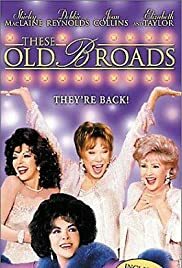 Four of Hollywood's greatest stars, Shirley MacLaine, Debbie Reynolds, Joan Collins, and Elizabeth Taylor team up for this absolutely hilarious comedy. MacLaine, Reynolds, and Collins play three former movie stars who appeared together in a '60's musical entitled "Boy Crazy", and team up once again for a reunion special. They're all terrific, but it's Elizabeth Taylor's delightful performance as an eccentric Hollywood agent that is sure to stay with you long after the movie is over. I hope they make a sequel! It would be such a great joy to see these four equally gifted ladies together again.